Sheikh Abu Maryam sits in a crisp, white jalabiya in the living room of his first floor apartment in the northern Syrian village of Marea. His beard is short, and his hair tightly clipped as he sits, cross legged, on the floor. He has just been walking the streets of Marea in a demonstration against the al-Assad regime which followed the Friday prayers. It is the early afternoon, and his young son now serves sweet tea on a tray in their home. He used to teach English in the village, but the schools have been closed for some time now; Marea has been bombed several times by loyalist jets over the past few weeks, and the deep sound of artillery fire regularly fills the night air. When the imam of his local mosque fled, Abu Maryam took over. And now, a year and a half into the revolution, he is forming his own katiba—a brigade of fighters—to fight with the Free Syrian Army (FSA), made up of a myriad of home-grown groups of fighters. The village is covered with graffiti depicting the pre-Baath party flag; as with Libya's revolution, the "new" flag is that of an earlier period in the country's history. "We are all under the flag of the Syrian revolution. You see it? The green, the white and the black, with the three red stars" he says. There are many flags flying in Syria's north nowadays, including the black flag with white Arabic script proclaiming There is no god but God, and Mohamed is His Prophet. "This flag is used by the jihadis," he says. "Some people say it is the flag of al-Qaeda; but it is not just used by them, it is not their flag." Abu Maryam sits at his home. Abu Maryam is forming his new katiba now because he feels that some of the groups fighting are not fighting with the ethical code that he feels should usher in a new era. "I have my own notions and thoughts about how we should deal with the army and the regime," he says. "We don't want to kill them, because they are Syrians like us. We will try to arrest them, and we have trained on that, and we will try to convince them to defect." If they don't want to join his brigade, then he will try to convince them to return home, and not fight against the Free Syrian Army. Abu Maryam's katiba, which he named "Ibn Walid", began when he contacted three defected soldiers. They would bring valuable soldiering skills. More volunteers then joined, and as the heat of the Middle Eastern summer subsides in the late afternoon light, his men can be seen out training on the outskirts of Marea, taking short runs followed by clumsy callisthenics and push-ups. Afterwards, the would-be rebels raise the less than athletic frame of their founder onto their shoulders in a celebratory fashion. Many brigades amongst the FSA do not adhere to Abu Maryam's ideals. As we arrive at one base in Hanano district of Aleppo, rebels are beating and kicking a young man in civilian clothes. His lip is bleeding and his eyes flash with fear. 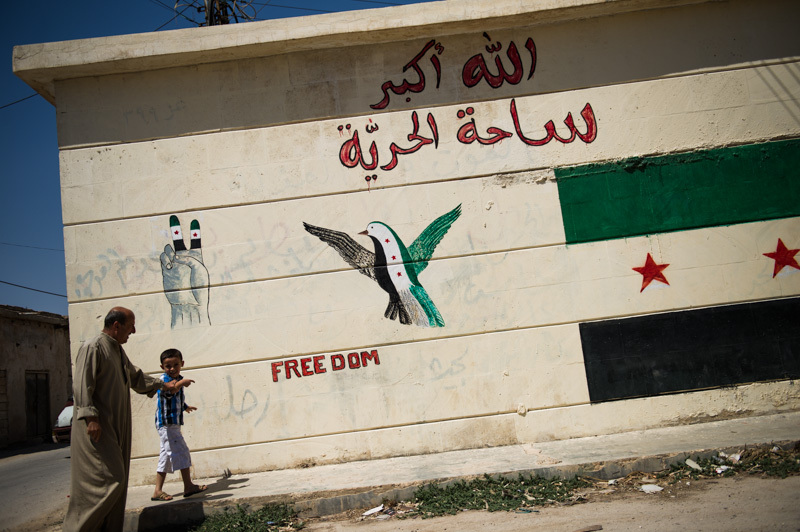 "Shabiha" the FSA fighters shout, before pulling him inside the graffiti covered building. The Shabiha—the dreaded thugs of the regime—are despised amongst the rebels, and feared by the population. If accused by the Shabiha of collaboration, you can disappear to a prison or a river bed. If denounced as being Shabiha, there is little you can do to avoid the emotive witch-hunt. At another base in Aleppo, a rebel shows off a video on his mobile phone. It depicts captured Shabiha being dragged out of a building, blood streaming down their faces. The men are lined up, and the sound of gunfire crackles through the tinny speaker as dust fills the screen. This lasts for over 45 seconds, until five blood soaked corpses appear from the dust; a summary execution. Najam, who did not wish to disclose his surname, now spends his days convalescing in the kitsch living room of his home in Azaz, several kilometres north of Marea. He was a Syrian jihadi fighting in Iraq, and joined the Free Syrian Army when the revolution began in his home country several years later. A friend sat with him describes Najam as "one of our big, great fighters," and he was injured when his group led an attack on an army position, going room-to-room until a soldier threw a grenade at him. His swollen right hand is missing the thumb and index finger, severed at the first knuckle, and puss oozes through the bandages covering his wound. Najam explains that the revolution here began with protests; police tear gas was met with by rocks, not guns. But in early August in 2011, a protester named Bassim Farouq Maranazy was killed by a gunshot. "This is when we realised that these guns were for killing the Syrian people, and not just for killing our enemies," says Najam. Shops began to close, and informers would take pictures of anyone perceived "pro-freedom", as Najam puts it, which they then passed on to army. If the regime caught anyone shouting hurriya—"freedom"—they would be taken away to jail. Najam says that military police came to his home twice, but he ran and hid in the trees near to the Turkish border, just a few minutes out of town. The army, he says, first came to Azaz on February 21, bringing with them around 50-60 tanks, and pick-up trucks from Aleppo. "All we had was 4 Kalashnikovs and maybe around 7 pump-action [shot-guns] for all the area" he says. With the arrival of the army, Najam and his comrades began to form katibas that would attack army checkpoints, from where they requisitioned weapons. As they gained greater arms, everything escalated, and the men went for bigger targets, eventually taking the police station. The army sent in reinforcements, with 68 tanks and 4-5 helicopters over the town. Najam and his men withdrew to the nearby village of Tel Rifat as they did not have the means to fight on such a scale. At times they took refuge over the Turkish border, knowing that the troops would not fire at the frontier. For three months they lay low, recruiting and training. They returned to Azaz and "surrounded the army". 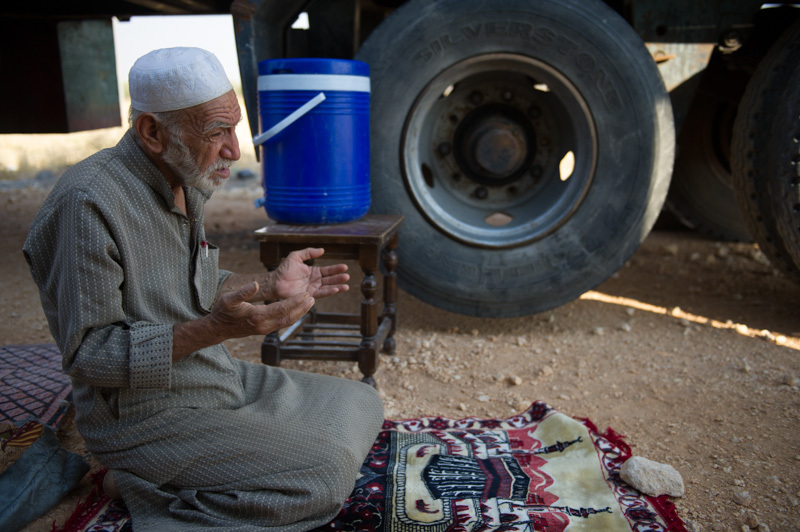 Ahmed Yassan, 73, prays on the roadside. It is not just those actively opposing the regime who have fled. Just a few hundred metres away from the border post, two trucks are parked and plastic chair arranged between the two of them. Ahmed Yassen who is 73, pulls out his prayer mat and lays it down on the stony ground. His family fled Azaz three days previously following an aerial raid one evening, and he says he will not return to the town, preferring to stay near the border. "If we hear more shelling, we will go to Turkey," he says. Over the border, thousands live in refugee camps. For the time being, these two trucks are home to his family, comprised of three men, four women, three adolescent girls and seven children, camped out on the roadside. Azaz, Tel Rifat and Marea form the backbone of a string of "liberated" towns leading from the Turkish border at Kilis, to Aleppo, the heavily contested economic powerhouse of Syria. In between lie several pro-Assad villages, a military airbase and training academy, and an extremely unnerving drive along back roads. The towns of the Free Syrian Army all bear the scars of conflict, from the flattened buildings of airstrikes in Tel Rifat, to the wrecks of tanks standing outside Azaz's main mosque, whose side has been cleaved open by shells. In the Sukari district of Aleppo, a Free Syrian Army fighter identifying himself as Abu Ahmed asks "why doesn't the government of your country do anything to help us?" as he looks around the detritus of weeks of street fighting, shelling and bombing. "In Libya, they helped get rid of Qaddafi. But here in Syria, they leave us to die ... We need a no-fly zone." Abu Maryam has a different take on things. "We want to liberate our country by ourselves," he says, before conceding "we only want weapons." Some of the men in his katiba will buy their own weapons, but he claims to have a little funding from Saudi Arabia. Nevertheless, access to weapons & ammunition is tough in Syria, far from the massive arms caches that were liberated during the Libyan revolution. Prices are high, and supply is limited. In one katiba's HQ in Sukari district, a middle-aged businessman with a double chin is smoking a cigarette whilst pouring himself a coffee. He isn't fighting for the revolution, but he gives money to the group. He says that the price of a Kalashnikov has tripled since before the revolution, up from 50,000 Syrian pounds to around 150,000 now - around $3000 USD. Foreign fighters are coming to the aid of the FSA. Whilst Abu Maryam says he wants Syrians to liberate Syria, he says he doesn't mind these combatants. "They came here by themselves", he said, offering an anecdote about his religion: "if someone in another country hurts even their finger, we should feel their pain. That is the belief in Islam." This view is epitomised by an Algerian man providing translation to a group of French and Belgian photographers in Aleppo's Old City. "I saw what was happening on television, the terrible things happening here, and couldn't take it any more." So he came. Whilst helping the photographers move around the city, he was scoping out different katiba, with the goal of joining the one that suited him best. Many of the groups, however, are made up of family members from the villages of the north, and their despise for Bashar al-Assad runs deep. Mahmoud, a rebel fighting in Aleppo, stands with his trouser legs rolled up, claiming that even this is a symbol of freedom. "No Bashar." He stands with his comrade, Ahmed, and they show off their gunshot wounds. One is still scabbed over on his back: the exit wound of a bullet that entered through his left shoulder. The men are still fighting with resolve, despite their limited means and high rate of attrition. One of their leaders hobbles in, and is quickly supported by a soldier. His left foot is bandaged, injured from a shell just a few days before. The men draw their strength from the close ties to one another. This group of around 30 men is a family affair. Mustafa, who previously studied English literature and knows of Shakespeare's Stratford, just 15 miles from my own hometown, comes from a village near Menagh, a feared airbase that is still being fought over. "This is my brother" he says, pointing to one of the men. "And this is my brother. We are five brothers here. And this is my cousin. I have many cousins here." Back in Marea, Abu Maryam prepares himself for the launch of his Ibn Walid brigade. One of his young recruits is concerned that he doesn't have the right trousers to match the uniform. Inside a hall in the town centre, weapons are in short supply, too. Of the 22 members present, only ten are holding rifles. The men haphazardly put up revolutionary flags against the fluttering crimson curtain of a wide, wooden stage. In the audience, a few young boys watch the preparations from the dusty, fold-up, velvet chairs. The spectacle's actors stand off-stage, tying their comrades' keffiyeh and taking photographs of each other on their mobile phones. Abu Maryam takes centre stage, sat behind a wooden desk. He is no longer dressed in the white robes of Friday prayers, but in a camouflage t-shirt and black, combat trousers. Behind him, nine of his men are arranged by Mahmoud, the group's media coordinator. "Three in the front row, or four?" he asks Abu Maryam, followed by "should the guns all point the same way?" The video of the announcement of Ibn Walid's creation will be posted to rebel websites. There is a hint of the class photograph to the whole scene, combined "Four Lions" farce. The thirteen would-be rebels not walking the boards are urged to give their military vests to those who stand behind Abu Maryam. They do not wish to be identified, willing to give their lives but not their names for fear of reprisals against their families. Once the video has been shot, the youngest of the men distributes a tray of fizzy drinks. Registration forms for the fighters record details akin to a sports club: name, address, phone number, marital status. But then comes "blood group", "weapon", and "specialisation". The men all take their seats in the audience as the brigade's spiritual leader, Sheikh Zakaria, takes to the stage. In line with Abu Maryam's ideals of ethical conduct for Ibn Walid, Sheikh Zakaria delivers a lecture on how the men should treat their prisoners. International Human Rights Law 101. The spectacle ends by a deep, sombre, revolutionary song led by Abu Maryam. In the coming days, his men will launch their "secret operations", as he dubs his plans. He wants them to be well planned, prepared, and for the men to know their targets, to "not just rush in".